One of the most popular iterations of Live Poker is 3 Card Poker. It is a simple poker game, and is quite fun and thrilling to play as a live dealer game. This form of Live Poker is played following the standard rules and players can benefit from employing basic to advanced strategies when they get tired of just trusting luck, and would like to increase their chances of winning. What makes it even more exciting is you can play it from the comfort of your home. Thanks to TV Casino Live, any poker enthusiasts from any part of the globe can indulge in online poker betting 24/7. Whether you’re paying in fiat or bitcoins, TV Casino Live is here to satisfy your poker cravings. Thanks to the versatility of TV Casino Live’s payment options, Bitcoin users can convert their digital coins with the help of Bitcoin-supporting payment processors. This makes playing with the cryptocurrency easier. Nevertheless, whether you play with bitcoins or fiat, you are guaranteed to experience loads of fun! When you arrive into a Live Poker room or table, the first thing you have to do is check the types of bets available for that particular game. Keep in mind that this differs from one live gaming site to the next. Traditional 3 Card Live Poker games offer an ante and play bet, both of which are bets that are against the dealer. In addition to that, a pairs bet and a side bet that could also be placed. Recently, a new bet has been added to enhance the game and this is available with the live dealer version. This new bet is the six card bonus wager and payouts can be collected based on the best five card hand from six combined cards, which are the dealer’s three and the player’s three. To raise or not to raise – that is the ephemeral question in this Live fiat and Bitcoin Poker casino game. Raise in ante and play whenever you are dealt a queen, a six and a four (or greater). This is the borderline hand, anything lower just fold and wait for the next hand. Since the dealer needs a queen or greater to qualify and the hands are scored according to the highest card then the next highest card and finally the last card, this combination of cards will give you the greatest chances of winning and the lowest rate of losing. The most popular bets that are placed in a Live Poker game are usually the Ante and Pairs Plus wagers for the same amount. However, the best way to bet on this game is to place the majority of your bets on the Ante, because this is where the best chances of winning lie. The fact that it also has the lowest house edge just seals the deal. On the other hand, playing Pairs Plus does provide higher wins. But it would be better to avoid temptation altogether and stay away from the Pairs Plus bet, until you establish a large enough bankroll, and could risk higher. Playing 3 Card Live Poker presents a lot of classic casino fun and entertainment, aye? Join in the Live Gaming fun today, here at TV Casino Live! Whether the Carribbean Stud Poker is a Poker game, or not, is disputed. Many even say that it is closer to BlackJack. Whatever kind of game it is, it's better to just play it here on TV Casino Live. This Poker game is probably the easiest one to learn because it has more cards than the usual Poker game. More cards means a higher chance to get a Flush or a Straight. Poker has never been simpler with this game! As the name suggests, you only need three cards to play this game. Less cards means a faster game,hence less suspense but more likely to get a nice hand. 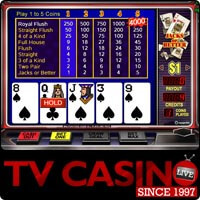 Play Live Three Card Poker now here @ TV Casino Live.